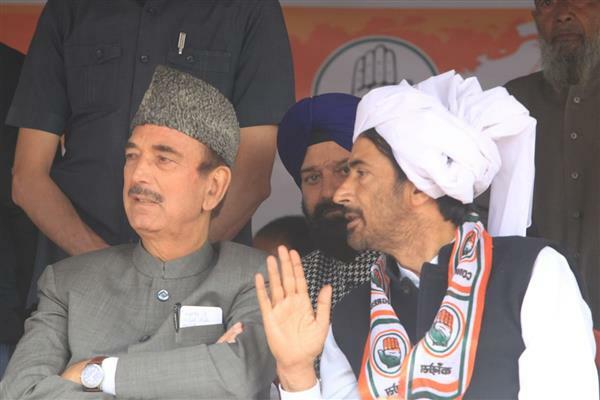 Srinagar: Stating that the wrong policies adopted by the Central Government were responsible for the deteriorating situation in Kashmir valley, the leader of opposition in Rajya Sabha and Former Chief Minister Ghulam Nabi Azad has said the people in the country and State will never forgive BJP for vitiating atmosphere. He also said that PM Narendra Modi’s lies and deceit will not save the sinking ship of BJP, as the people have realized the exploitation and political opportunism on the part of outgoing PM. Ghulam Nabi Azad accompanied by J&K Pradesh Congress Committee (JKPCC) President and Party Candidate was addressing largely attended public meetings at Kapran Dooru, Larnoo Kokernag and Chattergul in Shangus area today and reiterated his appeal to people to rise to the occasion to defeat the designs of Centre, as that people in the entire country have suffered immensely due to the approach & wrong policies adopted by Centre Govt. Addressing the Public Meetings Ghulam Nabi Azad expressed confidence that people in the country and J&K State will ensure victory of Congress Party Candidates with a thumping majority saying that the ensuing Lok Sabha Elections have provided them an opportunity to defeat the politics of exploitation and vendetta on the part of BJP Govt. He said the developmental scenario not only in the country but in J&K State has suffered immensely due to the arrogance of the Centre Govt, mere tall claims, false slogans, frivolous propaganda in order to gain electoral mileage will not deter the masses from ensuring defeat of BJP, the ensuing elections were the best opportunity for the people to give a befitting reply to Saffron Party and to teach it a lesson for failing people on all counts, besides making them fool on various developmental schemes, which have actually not happened during the five years misrule of Narendra Modi. I appeal to you (People) to ensure victory of Congress Party’s Candidate Ghulam Ahmad Mir to ensure opportunist parties were defeated, for the fact, Congress party was an instrument of service to the people and it will continue to serve them, besides ensuring equitable development of all the three regions of J&K. Addressing the gathering G.A. Mir said that Congress Party will not be cowed down by the false propaganda unleashed by outgoing PM Narendra Modi, who has sensed defeat before the poll outcome of 2019, for the fact, people have realized as to what Narendra Modi has done during his five year’s rule. Narendra Modi during his rule only strengthened corporate houses by not caring for the poor and down trodden sections living in the country, he has deceived and exploited people to serve his vested interests, Mir said. Hitting out at PDP and other smaller groups field by BJP RSS in the State, Mir said the misrule and mis-governance on the part of PDP BJP Coalition has pushed the state back to hundred years in every respect and people never forgive PDP for aligning with communal forces for the sake of coming into the power, Mir added. G.A. Mir appealed the people to defeat PDP BJP, as that will ensure peace and stability in the State. Former PCC President Peerzada Mohd Syed while addressing the gathering asserted hat since the PDP BJP unholy alliance assumed power in the state, the situation which had improved to a largest extent due to the efforts and friendly approach of UPA Govt started worsening, the peace initiative started earlier suffered immensely, loss of lives and injuries to thousands made the situation extremely volatile, despite the failures both PDP BJP alliance enjoyed power by not caring about the development, safety and security of the people. Peerzada made a fervent appeal to voter to ensure victory of G.A. Mir with a thumping majority, as that will ensure overall development of South Kashmir, he said. Those who addressed the gathering included vice president JKPCC and Ex-MLC Ghulam Nabi Monga, Ex. MLA Gulzar Ahmad Wani, Bashir Ahmad Magrey, Farooq Andrabi, Hilal Ahmad Shah, Surinder Singh Channi, Ex. Minister Syed Bashir, Vinod Koul, Anayatullah Rather, Gulam Mohi U Din Bhat, Ali Mohd Mantoo, Mohd Iqbal Mir, Mohd Iqbal Ahanger, Peer Shahbaz, PCC, DCC Members, Youth Presidents, Block Presidents and other Senior Party functionaries. Those who were present on this occasion included Irfan Naqib, Abdul Gani Khan, Subodh Mukoo, Waseem Shalla, Asif Beigh, Aijaz Rasool, Qayoom Badshah and others.